If you are looking for a rustic country backdrop but don't want to compromise on great local food for your dream wedding, The Arnold House on Shandelee may be just what you are looking for! We offer weddings year-round and can comfortably accommodate up to 200 guests. Located 2 hours north of New York City in the western Catskills, the Arnold House is a country retreat set on seven acres and nestled into the forest of Shandelee Mountain. We specialize in rustic barn and outdoor weddings on our beautiful grounds, including ceremonies in our meadows and near our pond, but also offer cozy cold weather affairs with our roaring wood stoves and comfortable indoor seating. Skip the pressure and let's have some fun - not only will we help you host the perfect wedding, we will also take care of your guests from when they first check-in to when they pack their bags to head back to reality. Let us help plan their activities and let you focus on getting ready for your big day! How about a game of baseball in the meadows, a group fly fishing outing, canoe races on Shandelee Lake or a hike in Catskill Park. Want the festivities to start a little earlier? A tour of some of the great breweries and distilleries in the area is always a big hit. Our chef can help craft the perfect menu for you - we are committed to sourcing our food from good people we know, so you can rest assured everything will be seasonally fresh and local. Menus can range from a casual BBQ to a formal sit down dinner. 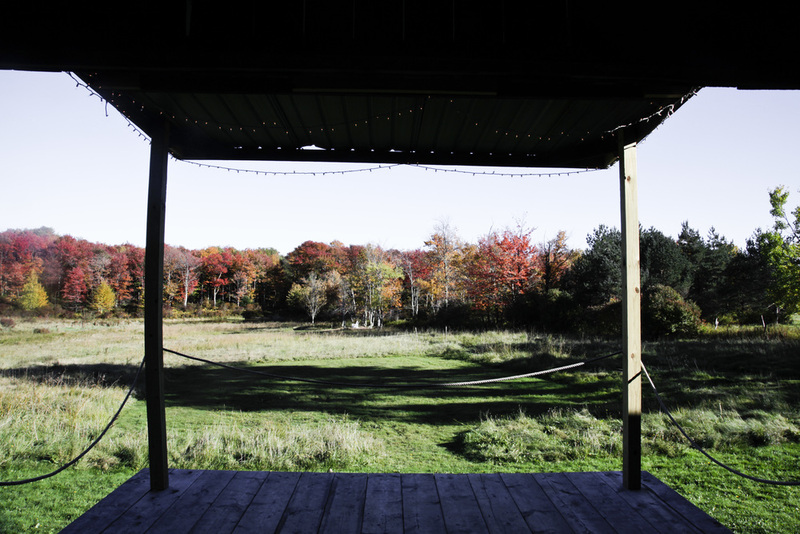 On our property, we can host various types of events - from formal tented affairs in our meadows to wild parties in our barn. Love to dance? Our classic barn is the perfect backdrop for your favorite band or DJ to kick things up after a great Catskill BBQ with your guests gathered around our handcrafted farmhouse tables. And maybe you want to wind down the night with some fireworks to truly wow your guests? We can get them settled with some local bourbon to sip while they roast marshmallows over a bonfire and rest their sore feet from a night of wild barn dancing...all while watching your very own firework display! And since this is your BIG day, maybe you want to extend it as much as possible and throw a wedding weekend instead to give you plenty of time - and different backdrops and experiences - to truly provide your loved ones with a wedding to remember - and give you enough time to soak it all in! We can help you kick things off on Friday night with a fun get together - maybe a casual cocktail party over a serious game of horseshoes at the Arnold or a family style dinner and bowling party at our sibling property, The North Branch Inn. And then we can help extend your weekend just a tad longer by offering a great brunch menu on Sunday before everyone heads their separate ways. However you wish to celebrate, we want your wedding to feel comfortable, personable and tailored to the two of you, while offering high quality twists and even a few surprises for your guests to help make the event as memorable as possible. We would be honored to work with you on such an important occasion and our team here is committed to helping you get it just right! Listed as one of New York Magazine's 15 new outdoor places to get hitched! Smoked brisket, pulled pork and a classic Catskills BBQ chicken. Or maybe a clam bake and local vegetables from the gardens. Oysters, shrimp and a towering selection of cheeses more your style? We are happy to work with you on the menu of your choice. This is your day - or as we say weekend - so let us know what your heart is set on, and we will work with you to design the perfect menu. We source as much of our menu as we can locally - either from a nearby farm or river or from our garden on property. For your bar selections, we are fortunate to have nearby a wonderful selection of breweries, distilleries and wineries. We proudly support our 'local bar package' but also have a wide variety of other wines, beers and spirits to choose from. Have a favorite drink you want to showcase for your big day? Let us barrel-age it just for you and serve it as your signature cocktail during the reception. And if you have a sweet tooth, you are in luck! Our in-house pastry chef can whip up exactly what you are craving. Although the time will fly by, we can help you extend the merriment with our late night bonfire and fireworks. And after dancing up a storm, our s'mores bar is the perfect way to round out the night by the fire. The Arnold offers multiple backdrops and locations for your wedding festivities throughout the weekend to help keep the weekend varied and exciting. If you want to stay on property, you can host your Friday night kick off cocktail party near the horseshoe pits, a wedding ceremony in the meadows by the pond and then a lively wedding reception in the barn. To wrap up the weekend, a departing brunch in our tavern, 1960's dining room or on our sun deck. If you want to host some of your events off property, we can work with you to plan an event at one of our sibling properties. Also available on a limited basis for your wedding weekend is East Hill Manor Farm, an expansive and breathtaking property of rolling farmland and meadows. This farm and venue, located 10 minutes from The Arnold, includes access to a pool and pool house for your guests, 360 degree views of the Catskills and beyond, tractor rides and much more. To begin planning your wedding weekend at The Arnold, please call (845) 439-5070 or e-mail info@thearnoldhouse.com. For further information, you may also view our profile on the Venue Report.